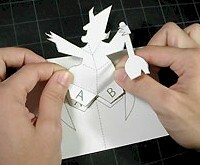 This great Halloween Witch Pop-Up is as much fun to receive as it is to make. If your copy machine enlarges you can make it even bigger. 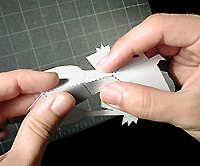 These more intricate pop-ups require finer cutting skills so they are more suited to the more advanced crafter. 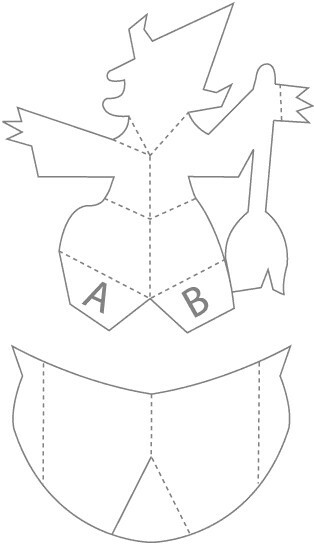 Print out the pop-up piece of the witch and her cauldron and the Witch's card. 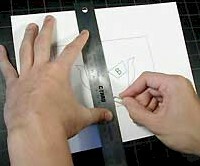 Using a ruler as a guide, take the rounded end of a paper clip (or a ballpoint pen that has run out of ink) and press along the dotted line on the center of the card and all of the pop-up pieces. 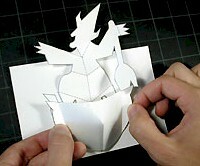 Carefully cut out the card, the witch and the cauldron following the solid, black lines. 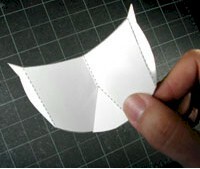 Bringing the sides towards you with the center moving away, fold the cauldron in half along the center dotted line and crease. Take hold of the small triangle at the bottom of the cauldron and fold it back and forth, loosening the fold line. 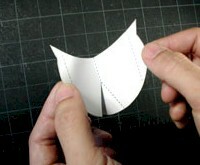 Fold back the left and right side of the cauldron along their dotted lines by pinching as shown in the pictures below. The center of the cauldron is pushed away from you. The sides tabs are pushed back. 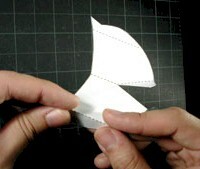 Fold back the small triangle again and apply a small amount of white glue. Pull the small triangle over to the left and aligning the center bottom with the bottom of the front of the cauldron. You'll notice that the whole piece begins to curve. This is good! Cauldrons are curved! 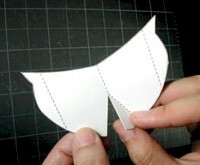 Press the small triangle firmly against the front and let the glue dry. Set the cauldron aside. 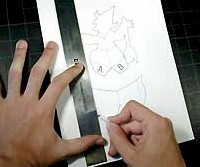 Take hold of the witch piece and pinch it in half just along the center dotted line. Release the witch and place her on a flat surface. 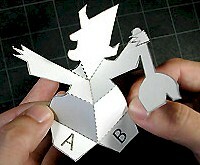 Take a hold of the tab marked "A" and fold it up against the witch's body. Open the tab back up to it's original position. Repeat the process with the tab marked "B". Take hold of the witch's body. 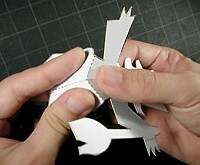 Pinch the lower half together while pushing the top half back. Take hold of the upper body. 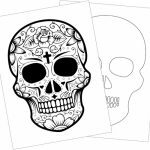 Pinch the witch's head forward along it's dotted fold lines. 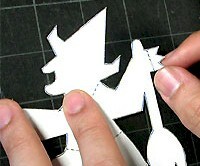 Apply a small amount of glue to the witch's open hand. 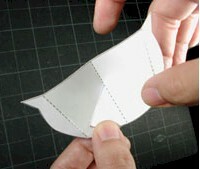 Take hold of the hand...and fold it over along it's dotted line, pressing firmly to let the glue dry. The lower body is coming towards you, the upper body is going back and the head is coming towards you. 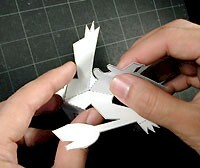 Apply a small amount of glue to the areas marked "A" and "B" on the card. Carefully position the witch over the glued areas. 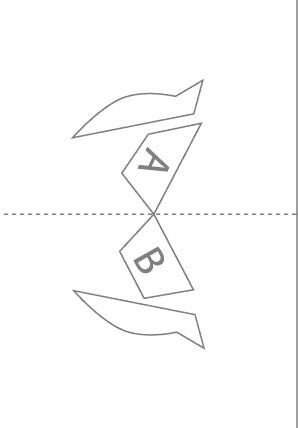 Line up her tabs with the areas marked "A" and "B" and press down. Let the glue dry! Apply a small amount of glue to the tab areas for both sides of the cauldron. Carefully position the cauldron over the glued areas (make sure the witch's broom stays OUTSIDE of the cauldron). Line up the tabs with the areas...and press down. Let the glue dry! Your pop-up Witch is ready! Happy Halloween! Robert works in his studio in New York City that he shares with his partner, children's book creator Matthew Reinhart. When asked about his work, Robert says, "We love making books. It's hard work but the best part is not having to worry about making a mess. When being an artist is your job, you can make as many messes as you want to!" Where is the handprint mitten?